Revealing mistake: In the parking lot of what is supposed to be Busch Stadium in St. Louis, Missouri, all the cars have Florida license plates. This happened because Ron Howard shot much of the film in Florida, not in St. Louis, Missouri. Continuity mistake: During the family dinner, the level of the wine in all the characters' glasses changes from one shot to the next. Continuity mistake: At the start of Kevin's party, the horse seen giving a child a ride has a small white mark on his face, between the eyes. When Cowboy Gil rides the horse he now has a long, broad white mark down his face. Factual error: In the opening scene at the baseball game, the announcer thanks the crowd for coming to see the St. Louis Cardinals. The fans are sitting in yellow seats, but all of the seats in Busch Stadium in St. Louis are red. Continuity mistake: When Helen throws the pictures of her daughter and her boyfriend down, the pictures are all over the floor, and by the chair she is sitting in. However, when her daughter comes in the room to pick them up, they are all in a pile closer to the coffee table. Visible crew/equipment: When Robards walks into the garage after Larry has returned the antique car, a boom mike is reflected in the trunk of the car. Larry Buckman: I didn't know myself until a couple of months ago. You see, a few years ago, I was living in Vegas with this girl. Showgirl. She was in that show 'Elvis On Ice'. Anyhow, we drifted apart, as people do in these complicated times, and then a couple of months ago, she shows up with Cool and tells me "You watch him. I shot someone. I have to leave the country " That's a parent? 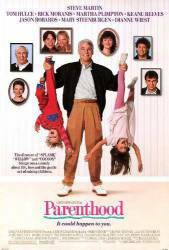 On the promotional movie poster, a frazzled Steve Martin is shown holding 2 children upside down by their ankles. On the set, sometimes the children would get unruly, so as a joke, Steve Martin once grabbed 2 of the unruly children and actually held them upside down by their ankles. Director Ron Howard saw this and decided it would make a funny promotional picture, so that's where he got the idea for it.